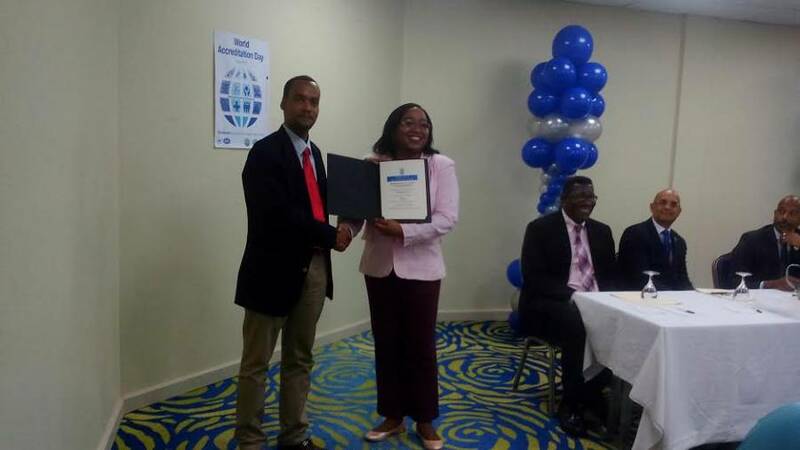 The Grenada Bureau of Standards Analytical Chemistry Laboratory has become the first in the OECS to be granted accreditation to the International Standard ISO/IEC 17025 — General Requirements for the Competence of Testing and Calibration Laboratories. “This laboratory is the first laboratory in Grenada to be ISO/IEC 17025 accredited, and also the first laboratory within a National Standards Body in the OECS to attain this accreditation,” said Acting Director of the Bureau Mr Robert Medford, when he delivered remarks during a World Accreditation Day function. Having this accreditation means that formal recognition of a laboratory’s capabilities ensures the results produced by the laboratory are reliable, accurate, traceable, and reproducible. “It therefore means that our manufacturers, agro-processors, exporters, the general public, clients of the laboratory both local and foreign, have the assurance that their results are accurate and reliable,” said Medford. He explained that exporters may not have to bear the cost of retesting in another countries, because the accreditation to the Grenada Laboratory means that the results are safe and reliable. “The use of accredited laboratory facilitates trade and economic growth, as a result of the use of internationally accepted testing and measurement practices,” he said. Prime Minister Dr Keith Mitchell in his feature address, said the gaining of the accreditation is the right message from Grenada when it comes to trade — the island has given its commitment to trade agreements that provide for adopting measures aimed and conformity to international regulation. It was explained by Medford, that Article 9 of the World Trade Organization’s Agreement on Technical Barriers to Trade (TBT) — requires that members, wherever practicable, formulate and adopt international systems of conformity assessment where a positive assurance of conformity with a technical regulation or standard is required. Article 6 of the agreement specifically recognizes accreditation as a means for realizing positive assurance. “Today, we can say, that we are following the rules of the global community and this lab must be seen in a very positive light,” he told the persons at the accreditation certificate ceremony. These persons included represents from regional standard bodies as well as the members of the Bureau’s Council. Mr Deryck Omar of CARICOM Regional Organisation for Standards and Quality (CROSQ) described the realisation of the accreditation for agro-processors to be able to better penetrate new market.